I think I have already spoken about grain markets being quite appealing to me because there is less noise, the pace of the market is a bit lower comparing to indices as well as the grains tend to trend more often and more clearly. Now it's time to share some very simple and very well-known for grain traders trading strategy. This is establishing support and resistance levels and trading the break-outs. As a rule the first trading hour is very hectic and volatile, that's the time when we stay in the sidelines and waiting patterns to establish and get hints from the market where it is going. After the first trading hour, this would be between 9 am and 10 am on the chart, we draw the resistance line at the high of the early activity and the support at the low point of the price action. From here we go in the side lines again and wait for the price action to break either way. Always it is good to remember that if it breaks in the direction of the trend it is much stronger entry signal rather if it breaks against the trend. Everybody knows that the trend is their friend. 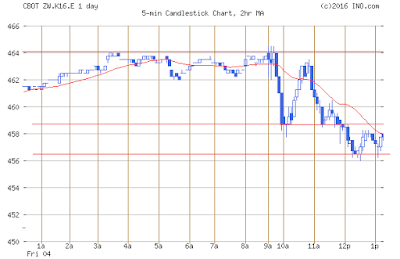 In our case the price breaks below just before 12 pm, goes lower and hits a new support bounces and closes in a range. Thus at about 12 pm we are entering short and once first two long candles are established we exit as signs of new support appear as well as market closer to the closing bell.